Consumer gas prices shot higher during the past week, up nearly 50¢ per gallon in some states, as the overall U.S. gas price settled at $2.47. That nationwide average is up by about 14¢ per gallon, lead by a major shift in prices along the West Coast, where prices went up an average of 37¢ per gallon. The stunning price increases are a major shift for U.S. drivers who, for six months from July 2014 through January 2015, experienced a precipitous decline in prices. 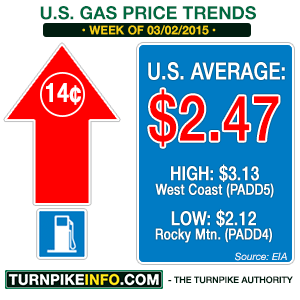 The weekly averages are detailed in the regular fuel price survey by the U.S. Energy Information Administration. Region by region, prices were up anywhere from 8¢ per gallon, as in the Rocky Mountain states, to upwards of 37¢ per gallon, a price increase shock experienced by drivers on the U.S. West Coast. State by state, the numbers were equally hard-hitting. In California, drivers are paying 45¢ more for per gallon this week than last, and drivers in Washington state are paying 27¢ per gallon more. In Florida, where spring breakers are about to inundate the Sunshine State, prices went up 11¢ per gallon. Meanwhile, the price of crude oil, which had been the arbiter of consumer gas prices during the past several months, is reclaiming some strength and has been trading in a tighter range during the past few weeks. The overall spate of declines, experience since last summer, appears to have come to an end. West Texas Intermediate, the domestic crude benchmark, has stabilized at around $50 per barrel, while the overseas index, Brent, has been trading above $60 per barrel. Meanwhile, production of refined fuels in the United States has been shifting to summer blends of gasoline, and that means the overall retail price of gas will continue to climb, even if no other pricing pressures get in the way. The problem is there are many pressures contributing to the higher gas price, including the shuttering of under-producing or older refineries and a strong U.S. dollar, which makes U.S. oil exports more expensive on open markets.